Managing your User Account Options? Home > Practice Jewel / Massage manEdger > Clinic Settings and Management > Managing your User Account Options? Note: Administrative settings are only important for those using our CLINIC EDITION, and those of you on our SOLO EDITION can ignore this portion. List on: Check this box to choose whether a given therapist appears on your private calendar. 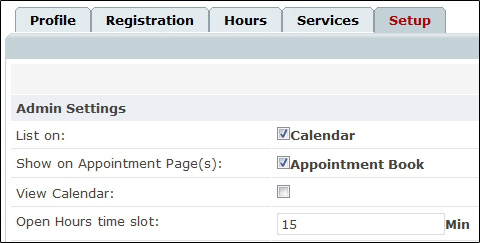 Show on Appointment Page(s): Choose whether a given therapist appears on your public calendar(s) or not. View Calendar: Check this box if you want the therapist to be able to access calendars other than their own. You can determine whose calendar they have access to from the show calendar box under Personal Settings. Default Schedule View: Here, you can choose the default view for the private administration calendar. 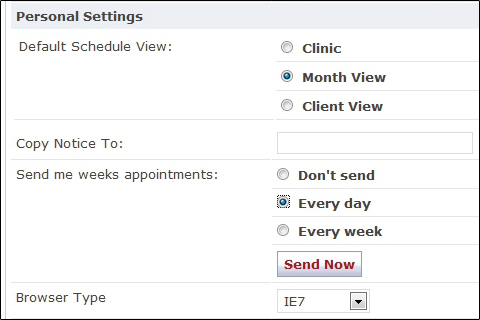 You can learn more about the individual calendars type by "How to set my default appointment display" clicking here. Copy notice to: Specify an alternate e-mail address here, and all your appointment notifications will be copied to this address. Send me weeks appointments: To learn more about this setting, please click here to read our tutorial on How To Activate Therapist Appointments. Browser Type: This is a technical setting. Only change this when asked by the support staff. When finished, click Save button . This concludes our tutorial on setting up therapist accounts.